The Products You Need For #IWokeUpLikeThis Skin EVERY Morning! 8 hours of beauty sleep may not be on your can-do list. But there’s absolutely no reason why that should stop you from looking fresh and radiant. An overnight treatment is hands down the best way to hydrate and rejuvenate your skin while you hit snooze. If your daytime skincare routine needs a boost, slather on an overnight mask and wake up to younger looking skin! Go on, check out these overnight skincare products for dreamy skin in the AM. The Kumkumadi beauty fluid is an ayurvedic overnight beauty miracle that lightens, brightens and repairs fine lines as you sleep. It contains a unique blend of essential oils to help you glow. Saffron, Vetiver, Indian Madder, Lotus and Liquorice are some of the key ingredients in this serum. Vitamin C is the best thing for your skin, it truly is an underrated product. Check out this Vitamin C booster serum by Age Lock to lighten and brighten your skin, fade acne scars, pigmentation and give you a gorgeous lit from within glow. Versatile enough to be used day and night, your skin will thank you for this. 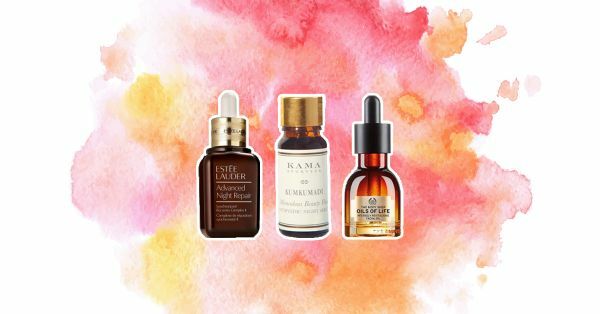 Boost your nighttime skincare regimen with this facial oil from The Body Shop. It contains a blend of seven skin loving essential oils. The lightweight facial oil will give you radiant, nourished, wrinkle free skin in 4 weeks. All you need is 1-2 drops. For best results, use it over your night time moisturizer. This is the best anti-aging serum, period. Your mother probably was a fan too. This serum has been tested on Indian skin, proven to target fine lines, wrinkles, dullness and crows feet. Apply 2 drops of this serum at night, after you wash your face and we promise you won’t look back. It is worth every penny. This overnight mask from Lakme has mineral glacial water as the key ingredient that packs a punch of moisture into your skin while you sleep. It is lightweight and non greasy, all with a promise of giving you nourished, supple glossy skin; you can’t go wrong with this one. Just because you’re on vacation that doesn’t mean your skincare regime should take a backseat. Innisfree’s capsule recipe packs come in a range of ingredients tailored to suit your skin needs. The product is small and compact, making it your perfect travel buddy. We recommend slathering it on just before your nap on your next long haul flight. Wash it off once you land and wake up to bright clear skin! Night time skincare regimens are easier since you’re not late for work or rushing out the door. So why not maximize your zzz time to transform your skin with these targeted treatments. Go ahead and hit the sack, gorgeous skin lies ahead, promise!